This here fuzzy trash bag has taken to the idea of stashing every little thing she finds in her stomach instead of your more typical hiding places. Brush pen and black walnut ink, extra shading in PS. First try witht my new brush pen on this. I like it so far, a bit more consistent than my other brush, bristles snap back to a point better, no need to dip. The only down side is the ink is only "water resistant" so I have to be a little more careful with using water over the lines, but light brushing doesn't hurt it much. It does come up a little bit when erasing my under sketch though. Definitely not as permanent as my india ink, that stuff doesn't come off or lighten up no matter how much water or erasing I do over it. well, that is a trip to the vet. 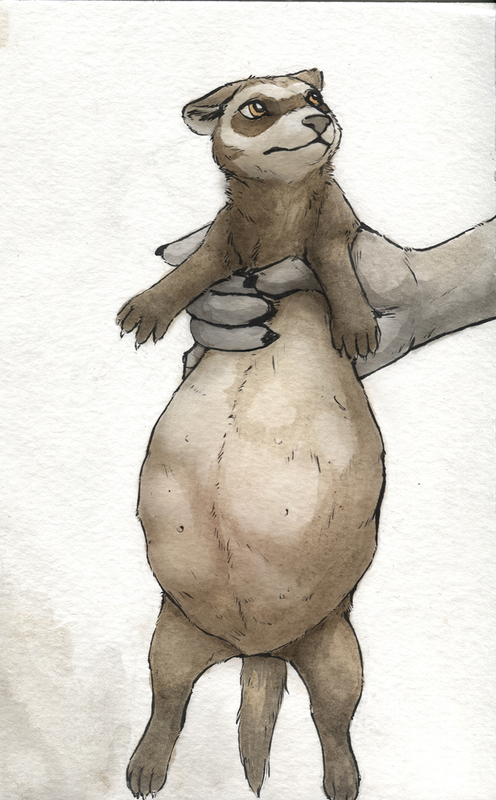 This reminds me of a pic I know of a prego ferret.